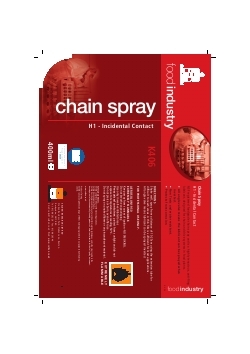 A NSF registered foodgrade chain spray and highly tenacious, anti-fling lubricant, designed for chain and drive systems in food plants. • All angle valve means the lubricant can be sprayed when inverted. • Non Toxic and water resistant. • Protects from corrosion. Shake well, spray from a distance of 15-25cm using the extension tube for difficult to reach areas. A thin film is sufficient for most applications. All angle valve means lubricant can be sprayed inverted.